But Critics Say Federal Government Must Give Official Apology To Make Such Honours Meaningful! While the stamp honours Sikh pioneers who made such great sacrifices and faced such harsh racism in Canada – critics say such gestures are meaningless without an official apology from the government of Canada, something that was given to Chinese-Canadians by Stephen Harper Conservatives who somehow feel South Asians-Indo-Canadians are not worthy. Prof Mohan Singh Memorial Foundation organizer and founder Sahib Thind told the LINK the Conservatives have been dividing the community by doling out grants to some groups while ignoring those who have been fighting to get an apology. OTTAWA – Canada Post has unveiled a new stamp to mark 100 years since a ship full of mostly Sikh passengers who were turned away from Canada and sent back to India, where they were jailed or killed. While it honours Sikh pioneers who made such great sacrifices and faced such harsh racism – critics say such gestures are meaningless without an official apology from the government of Canada, something that was given to Chinese-Canadians by Stephen Harper Conservatives who somehow feel South Asians-Indo-Canadians are not worthy. The Komagata Maru arrived in Vancouver’s Burrard Inlet on May 23, 1914, carrying 376 British subjects, primarily Sikhs from India’s Punjab region, as well as a number of Hindus and Muslims, reported Canadian Press. The ship was denied permission to dock and only a handful of passengers were allowed to stay in Canada, with the rest remaining on the ship as it was escorted out of Canadian waters two months after its arrival. When the ship arrived in India, 19 of the passengers were shot and the rest were imprisoned. 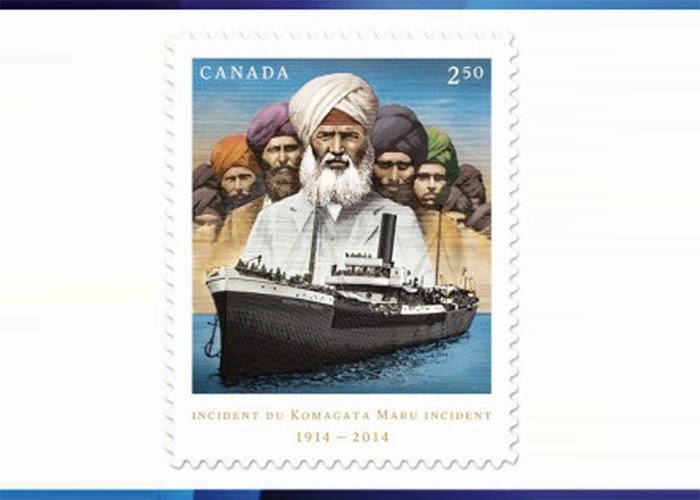 The international-rate stamp features an image of the Komagata Maru, with a group of men in Sikh turbans in the background. Prime Minister Stephen Harper did deliver an apology for the Komagata Maru incident in 2008, and the B.C. legislature passed a motion apologizing on behalf of the province the same year but politicians like Surrey-North NDP MP Jasbir Sandhu continue to push for an apology on the 100th anniversary of the Komagata Maru. Sandhu is not alone as other Sikh community groups like Prof Mohan Singh Memorial Foundation organizer and founder Sahib Thind has been very vocal as well. Thind told the LINK the Conservatives have been dividing the community by doling out grants to some groups while ignoring those who have been fighting to get an apology. “Due to the discriminatory “continuous journey” regulation, passengers were prevented from disembarking while the ship remained in Burrard Inlet for two months. Passengers were denied basic necessities, such as food and water,” MP Sandhu said in the House this week. This was one of several incidents in the early 20th century involving Canada’s exclusion laws designed to keep out immigrants of Asian origin and descent. Sandhu said the tragedy of the Komagata Maru marks a dark chapter in Canadian history, one that must be honoured by the recognition of the failures of our past and inspire us to pursue a more equal Canada for future generations. “Along with my NDP colleagues, I will continue to push for a formal official apology on the floor of the House of Commons for this tragedy. An apology is long overdue and a necessary part of the healing and reconciliation process,“ he said. Devinder Shory, Member of Parliament for Calgary Northeast, joined Prime Minister Stephen Harper, along with Conservative caucus colleagues, to unveil a new stamp in commemoration of the 100th anniversary of the Komagata Maru tragedy. “The Komagata Maru tragedy was an unfortunate black mark on our Canadian history,” said Calgary Conservative MP Devinder Shory, who joined Prime Minister Harper and his Conservative colleagues, including former MP Gurmant Grewal and his MP wife Nina Grewal, in unveiling the stamp in Ottawa on Wednesday.